Getting a good night’s sleep is critical for your body to function properly, it is just as important as eating well and exercise. However, when you don’t get enough sleep, several aspects of your health can be seriously impacted. For people that suffer from sleep apnea disorder, getting enough rest at night is almost impossible. 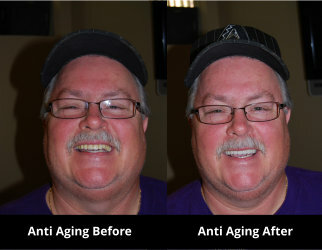 To solve this problem, consider dental sleep apnea treatment by a qualified sleep apnea dentist. This condition affects the way you breathe while sleeping, often leading to frequent, loud snoring. Obstructive Sleep apnea is a common disorder in which you have one or more breathing interruptions or blockages while sleeping. In this condition the throat can close, leading to cessation of breathing. Apnea is defined as “a cessation of airflow for at least 10 seconds or longer”. People with sleep apnea stop breathing while they are sleeping, sometimes hundreds of times a night, sometimes for a minute or even longer! All this occurs while the person is usually unaware while sleeping, and affects some 25 million Americans of all ages. Typically, someone with obstructive sleep apnea will snore heavily, and then stop breathing. The bed partner will observe that the person struggles to breathe but here is no snoring sound. These periods of lack of breathing are followed by sudden attempts to breathe, often accompanied by a gasping or choking sound. The person with OSA will partially awaken leading to fragmented, non-refreshing sleep which can be the cause of excessive daytime sleepiness. The lack of breathing also causes the oxygen levels in the blood to fall, which leads to multiple medical problems. Diagnosis is based on the results of an overnight sleep study, called a Polysomnogram (PSG). Other factors in determining OSA are patient evaluation and history. Continuous Positive Airway Pressure (CPAP); a pressurized air generated from a bedside machine line a vetilator in which air is delivered through a mask, covering the nose. The force of the pressurized air pushes the airway open. This condition can be treated by utilizing dental devices effectively and successfully. Oral appliance therapy is one of the leading CPAP alternatives and has been used for numerous years in Dental medicine; over 40 different types of appliances have been used to date to treat this disorder. Most of these devices are acrylic and fit inside your mouth comfortably. These devices help adjust the position of your jaw and tongue so that your airways remain open. These appliances can help treat snoring and sleep apnea simultaneously. Once worn these dental appliances help to maintain an open, unobstructed airway. Dr. Zamani uses the most state of the art techniques and appliance treatment, the latest in research proven materials and techniques. 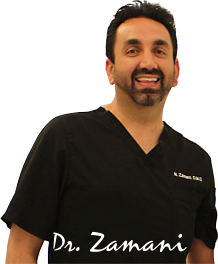 Dr. Zamani uses the most relaxed position of the supporting muscles of the jaws, neck, shoulder and throat using Neuromuscular techniques to fabricate the SomnoDent appliances. Using the latest advances in techniques helps ensure the very best that modern Dentistry has to offer in order to help our patients with sleep apnea. It’s important to note that you cannot just treat snoring-you must treat sleep apnea to prevent health complications. If you are suffering from sleep apnea and have been diagnosed through a sleep study, please visit Dr. Zamani to find out how you can begin living life well-rested.